Who doesn’t know anything about the Google Nexus 6? Well, it is a supersized version of the new Moto X that has been given a two-handed booster shot and, aptly, has received a Lollipop. This is the first ever Smartphone which is designed to run Android 5.0 Lollipop and it is not that hard to believe that there is no better way to experience all of the changes Google has made to its operating system. It demonstrates the new Material Design interface on a massive 6-inch display, moves seamlessly between apps thanks to the latest Snapdragon processor and 3GB of RAM, and lasts all day with a Qi-chargeable 3220 mAh battery. The Nexus 6 has a mind blowing 5.96-inch AMOLED display that is not only bigger and brighter than the Moto X; it edges out the 5.5-inch iPhone 6 plus in every way. The reason for the same is because it doubles down on Apple’s full HD screen with a more stunning 1440 x 2560 resolution and 493 pixels per inch. It’s officially welcomed into the Quad HD club. One more thing, that Quad HD club already includes Android members like the LG G3 and Samsung Galaxy Note 4, but Google Nexus 6 stands out from the pack with its exaggerated display. There’s no 6-inch juggernaut like it and its edge-to-edge display and on-screen soft buttons maximize the screen real estate while minimizing the overall phone’s dimensions. It’s bigger without feeling overbearing: 159.3mm (6.27in) tall, 83.0 mm (3.15in) wide and a depth of 3.8mm – 10.1mm (0.15in – 0.39in). It weighs noticeable but acceptable 184g (6.49oz). Google Nexus 6 also feels better in the hand for its size. Motorola’s design, borrowed from the Moto X, gives it a sturdy Bend Gate-free aluminum metal frame and gently curved back. The curve feels natural against hand or, in most cases, hands and the plastic back is at least smooth. There are no Moto Maker customizations for wood or leather backs here. Nexus 6 colors are limited to either Cloud White or Midnight Blue with the advantage of being compatible with Qi wireless chargers, a feature all tricked-out Moto X phones don’t support. Google’s new phone also benefits from dual speakers at the top and bottom and comes with a Turbo Charger that juices up the phone with six additional hours of battery in just 15 minutes. 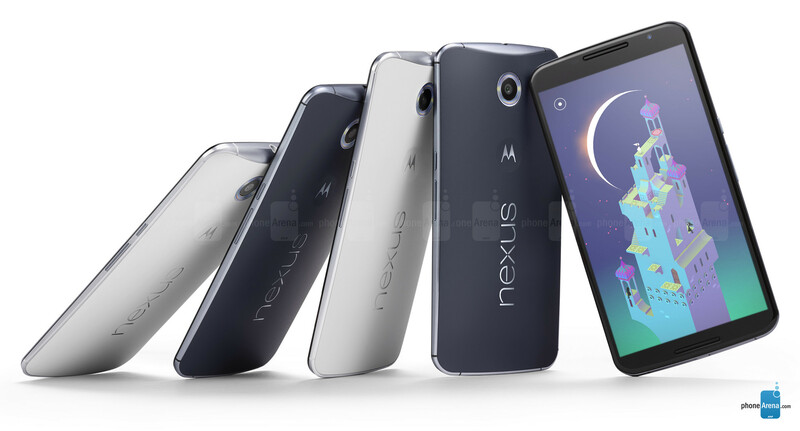 Mainly, the essence of the Nexus 6 is a 2.7 GHz Qualcomm Snapdragon 805 quad-core processor that has an Adreno 420 GPU. It’s a top-of-the-line chip for Google’s largest Android phone yet. Moreover, it has got a 3GB of RAM and a reasonable 32GB or 64GB of internal storage. One thing that is worth noticing is that there’s no silly 16GB model to cheapen the value .All of these Nexus 6 specs aren’t overkill. It’s important for the lightweight, but feature-filled Android Lollipop update that’s pre-installed on the phone. Android does more things than ever in the background: running multiple apps, receiving notifications that hit the new lock-screen non-stop, making the instantly accessible Google Now available with one swipe to the left and performing voice searches whenever you are going to say the “Okay Google” prompt.